Clearly, after months of almost daily visits, she knows we're there and we don't hurt her. It was Zerline who had noticed her return. I thought Zerline went over to the kitchen to drink some water, but instead she looked outside, through the kitchen door. Her stance with ears forward told me something had caught her attention. When I followed her to the kitchen, I saw it was the doe, and the doe had noticed Zerline too. I stepped back and could see how the doe and Zerline studied each other, both standing absolutely still, in a dance of curiosity. When the doe relaxed again and started nibbling on the flowers and rose buds like she usually did, I couldn't resist to make the next step and took Zerline out through the front door. The doe was just around the corner, and while I tried to lure Zerline a little further away to create some distance, the doe surprised us and came around the corner herself. She couldn't see me standing in the corner before the door, but she could see Zerline. And Zerline could see her. Their dance resumed, only this time they were just 5 feet apart. Then, after what felt like minutes but were only seconds, the doe turned and ran off. Zerline's first instinct was to run after her, but she stopped before the 30 foot leash she was on had reached its end. 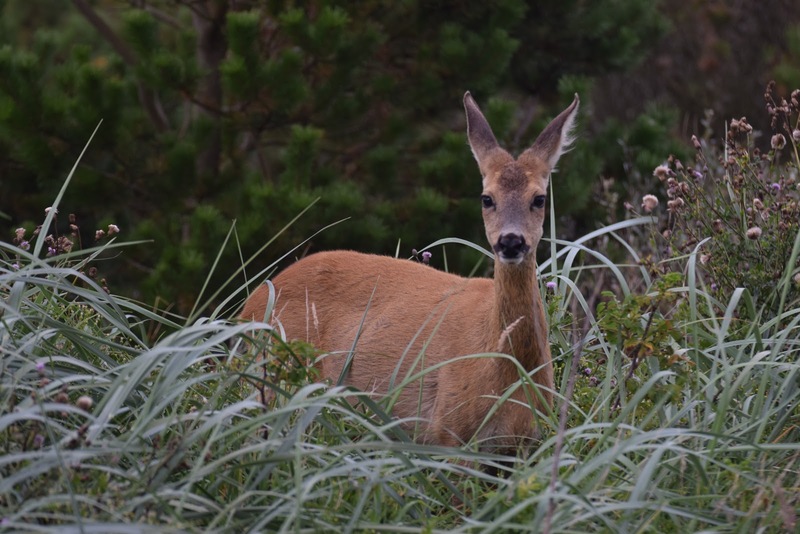 Zerline reached the top of the berm where the doe had been standing just seconds before and her gaze followed the doe disappearing into the dune landscape. Curiosity. It's what defines Zerline best. I remember when I picked her up as an 8-week puppy. With her big brown eyes she looked right at me, studying me, trying to figure out what kind of critter I was, sizing me up. She didn't divert her look. She could look right into my eyes for minutes. So could I in hers. While she grew up, her curiosity helped me re-acquaint with all the beauty we find outside the door. Everything had to be studied. 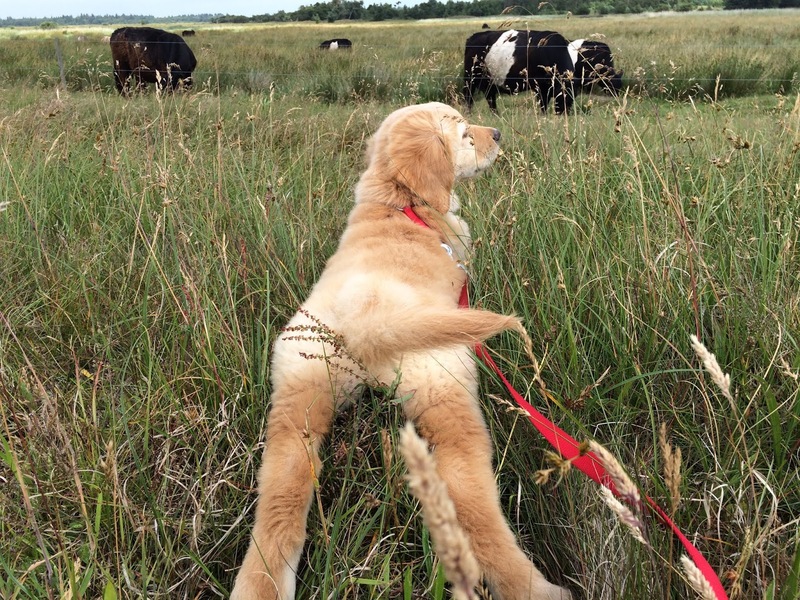 Everything had to be observed and scrutinized, from butterflies to cows. She chooses not to chase. She sees the fun of chasing Tilde when Tilde is chasing something, but so far she would never opt to chase herself. Zerline much rather observes and learns. She has had the advantage, unlike Tilde and Kenzo and Viva before her, that nature is not something you only see in the weekend. Zerline is my first to grow up in nature itself. We only have to step outside the door and the animal world shows itself. First in scent, and then in experiences. Zerline has seen them all, deer, foxes, rabbits, hares, snakes, she is no stranger to wild-life. She even goes as far as to join us watching a nature documentary on TV. Alarmed by the animal sounds coming out of the box, she jumps up on the sofa and studies the images in awe, those are some animals she has never seen before. I can't explain it looking at her family, they are all chasers. I am even more baffled that Tilde, the Chaser of Chasers, hasn't taught her otherwise. Zerline is definitely being Zerline, and shows a side of herself which makes her so unique to me. What a sweet soul Zerline is. Thanks so much for sharing your beautiful story.